Apparently the iPhone and iPad are great at taking down monsters. Who knew? 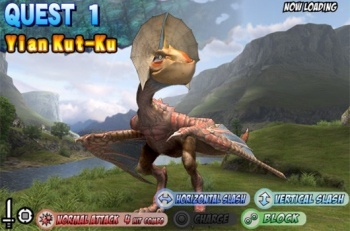 Capcom has ported the Monster Hunter games to just about every system under the sun. Now, though, the series is arguably getting its widest release ever: Capcom is putting it out for iOS devices. Players swing their weapon ... by tapping the target with one finger. Blocks can be performed by tapping the screen with two fingers while evading is accomplished by sliding two fingers left or right. Basic movement can be accomplished by sliding a single finger, left or right. Not much has been revealed about the game yet, including a release date or price point. Presumably, the game will be on display at E3 next month, where some more information will be unveiled.